A collaborative UC-led team in California's North Coast has been conducting research on conifer encroachment for the last several years, and is just wrapping up a 3-year, ANR Competitive Grants-funded project. 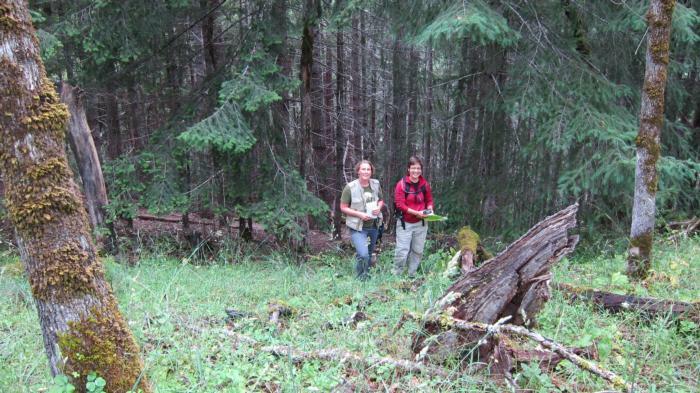 That project, Tools for a Changing Landscape, set out to better characterize the conifer encroachment issue, which had been the focus of relatively limited research up until that point. Previous studies of conifer encroachment were either outdated or limited in geographic scope, so Tools for a Changing Landscape aimed to characterize the problem within the current context and at a larger scale. The study included ten sites (90 plots) across Humboldt and Mendocino counties, and looked at age structures of oaks and conifers, tree health, and understory diversity across a spectrum of open to encroached oak stands. Preliminary project findings show clear patterns of encroachment in Oregon white oak and California black oak systems throughout the North Coast region, with oaks being consistently and significantly older than neighboring conifers. Findings also point to the exigent nature of the issue, with conifers establishing and gaining stand dominance in as little as fifty years. Further, preliminary findings demonstrate decreased understory diversity and severely compromised oak health in encroached stands, supporting previous work by others throughout the range. 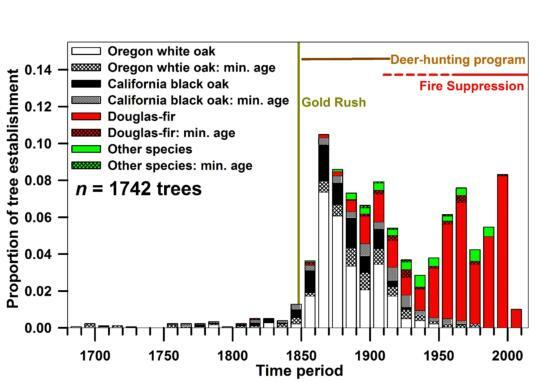 Regional tree establishment in mixed oak-conifer woodlands from 1742 trees cored across 10 sites in northwestern California. Check out this Story Map to learn more about the project sites and findings! Publications from this project are currently in progress, and further research is underway. Email Yana Valachovic (yvala@ucanr.edu) or Lenya Quinn-Davidson (lquinndavidson@ucanr.edu) for more information.